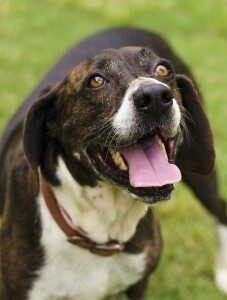 6-year-old, Hound and Border Collie mix Wilma Flintstone needs a home. When her previous owner passed away, her life took a sudden and drastic turn — no home, no family, and living in an animal shelter with 90 other dogs. The good news is that she has a heart and love that surpasses her circumstances. She’s an amazingly well-balanced pooch, the Hound in her likes to relax and chill out. If she has visitors who want to play, she’s quick to oblige and will show off her Border Collie skills running circles around everyone. Medium-sized Wilma loves kids, older folks, and everyone else in-between. She is a resilient dog who wants to once again have a loving companion and warm home to call her own. Silly and swift, Stoney is a cat lover’s action dream. At ten months old, he still has all the playful exuberance of a kitten and will be a footloose and fun-loving cat for years to come. 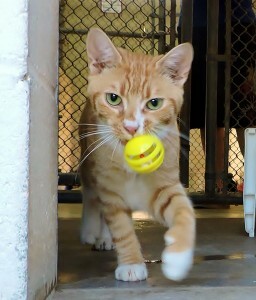 Stoney has a creamy, orange tabby coat with little white mittens that are perfect for getting into laughable mischief. Although he is deaf, he really needs an outdoor area to live and perform his acrobatic antics and the “song of his people.” He likes to sing, but can’t hear himself to know that … well, his style is “unique.” Stoney is fine around other pets, but because he is packed with high-throttle energy he is best suited for homes without small children. Add some entertaining kitty hijinks to your life by adopting Stoney!